Every week, the Official ArtScroll Blog features a free learning download to enhance your shabbos and your learning. 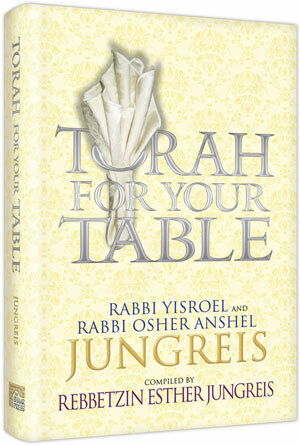 This week’s free learning download is excerpted from Torah for Your Table, by Rabbi Yisroel Jungreis and Rabbi Osher Anshel Jungreis with Rebbetzin Esther Jungreis. This warm volume centers around the Shabbos table and invites the exchange of ideas and discussion. Make sure to visit the blog every Thursday for the week’s free learning download! Click here to additional titles by Rebbetzin Esther Jungreis.